Great piece by Charles Dean on the enduring significance of Wallace's famous inaugural. 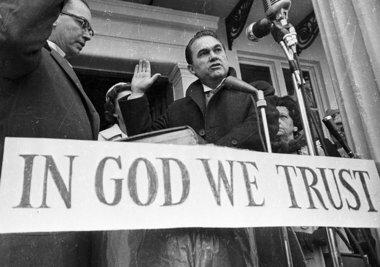 George Wallace's 1963 inaugural address: A speech that lives in infamy (slideshow, video) | al.com: Monday (January 14, 2013) will mark the 50th anniversary of Wallace's inaugural address. It was a speech written by Asa Carter, a Ku Klux Klan leader who told members of Wallace's inner circle that he was sure the "segregation now, segregation tomorrow, segregation forever" line would stand out, said Dan T. Carter, Wallace's biographer.